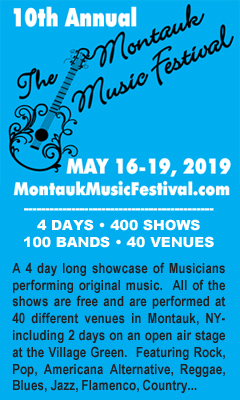 For every national article, reality television shoot, and celebrity sighting on the beaches of our beautiful town of Montauk, an increasing amount of energy builds to keep Montauk, Montauk. 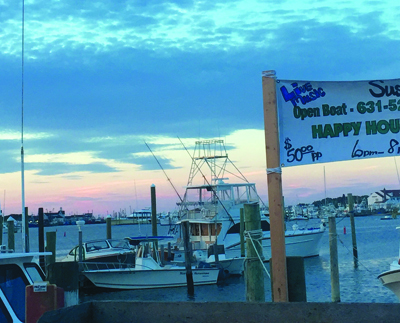 Searching for the remains of what we know and love about Montauk can be a challenge, until you step into Westlake Fish House, nestled harbor side at the end of Westlake Drive. That Sunday night was a lively union of music from our favorite local band, The Lifeguards, with a healthy mix of locals, tourists and weekenders. By all appearances Westlake brings back the Montauk we are most fond of, guests in flip flops paying homage to the sorbet hued sunset, nibbling on sushi and sipping on drinks mixed by April at the bar. This is a restaurant still standing, a captain in a town of vessels that has not jumped ship for flashy, trendy waters. Westlake is the real deal. The endearing blend of guests that night included old friends, fellow surfers, extended families with adult and young children, Manhattan couples and local fishermen. Westlake succeeds in fine-tuning the yearning for the casual, authentic Montauk experience with a robust menu and full-bodied cocktail menu and wine list. Chef and owner Larry Kolar, along with co-owners Laura Escobar and James Lyons maintain Westlake’s charm and character of a polished fish house, perched over calm harbor waters with enough elbow room for mingling with friends at the bar. 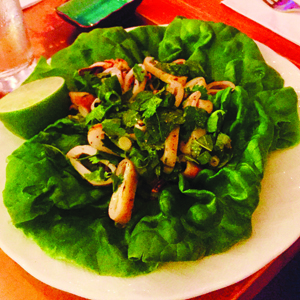 We had to taste the signature Westlake Salad of grilled, local calamari tossed with mint, basil and cilantro piled atop a blanket of cool bibb lettuce. Our traditional fried calamari was paired with a sweet chili teriyaki dip, a bold blend of flavors for dunking each warm, crisp ring of battered squid. 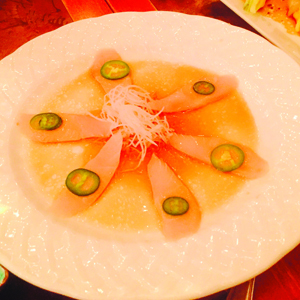 We continued with the delicate Yellowtail Tiradito, slivers of sashimi yellowtail crowned with shaved jalapeño in a pool of Yuzu sauce. 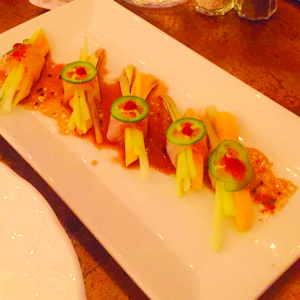 We adore the Fluke and Mango Roll of mango and cucumbers wrapped in buttery sashimi fluke that springs to life when drizzled with a spicy citrus sauce. At Westlake, the sushi plays a starring role. The standout Montauk Roll was stuffed with spicy tuna inside and bejeweled with raw fluke outside. The Rough Rider roll of crispy shrimp tempura, thin cucumber sticks, spicy lobster and seared tuna outside rivals the East Coast roll of spicy salmon, plump mango, and avocado inside, layered with pepper tuna outside. 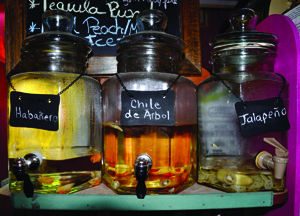 In keeping with the seafood tradition you will find a selection of Little Neck Clams, Jumbo Shrimp Cocktail and Regional Oysters. Other seductive dishes include the carefully grilled Salmon, hearty St. Louis Ribs with homemade cole slaw and corn on the cob, and Mushroom Soba noodles of shiitakes, napa cabbage and bok choy. For the turf there is a Sirloin Strip with roasted fingerling potatoes and braised Pork Shank with quinoa, rosemary and carmelized pearl onions. That steamy summer evening called for Rosé and beer, a parade of cold glasses of Chateau de Brigue from Provence, and Belgian Style Blue Moon accessorized our table. 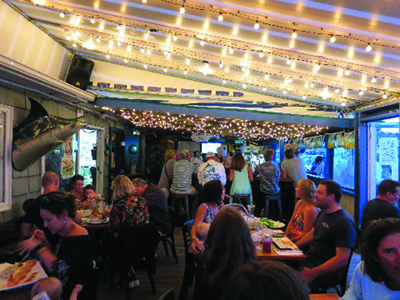 Westlake Fish House proudly revives Montauk memories of fishing, dockside dining with family and friends, with summer cocktails and live music. Much like Montauk itself, Westlake is seasonal, so indulge in the casual spirit and local, fresh cuisine on the water while you can. 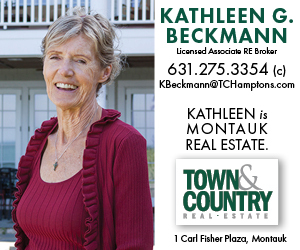 Westlake has a strong imprint on the restaurant scene, and remains a rare treasure that truly embodies Montauk.